In the politicized world of cougars, the state has ordered “third-party” pathology tests from Washington State University on the cougar that on Saturday killed one bicyclist and severely injured another. 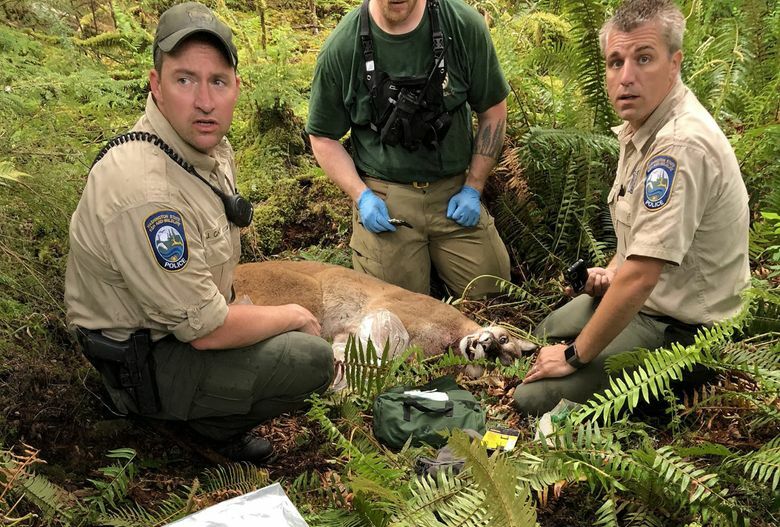 The state’s Department of Fish & Wildlife will have “an independent, third-party” forensic necropsy conducted on a cougar that attacked a pair of bicyclists near North Bend on Saturday, killing one person and mauling the other. The independent review is a nod by the state to the politicized world of cougars, one of the state’s largest and most successful predators, despised by ranchers and defended by conservationists. A 2015 Seattle Times story detailed how the state had boosted cougar hunting, despite a drop in complaints. The 3-year-old cougar killed S.J. Brooks, 32, of Seattle, and injured friend Isaac Sederbaum, 31, also of Seattle, on a remote, dirt road northeast of Snoqualmie. Sederbaum was released from Harborview Medical Center on Tuesday. The cougar was tracked by hounds up a tree and shot by wildlife police. The tests will be conducted by Washington State University’s Animal Disease Diagnostic Laboratory College, which carries out some half-million such procedures a year. He said he expects results to being “trickling in” within a few days. The dead cougar weighed 101 pounds. A cougar that age, considered “a sub-adult” – should weigh 130 to 140 pounds, said Beausoleil. The politics began in this state in 1996 when voters approved Initiative 655 that banned the use of dogs – that would be hounds – for hunting cougars. Voters decided there wasn’t much sport in using hounds, said Beausoleil. Since then, he said, he’s counted 17 cougar legislation bills – “and that didn’t include the failed ones” – most trying to legalize the use of hounds for tracking and hunting the big cats. Most of the proposals, he said, came from Eastern Washington legislators whose constituents include farmers and ranchers..
One such legislator is Joel Kretz, a Republican from Wauconda in Northeastern Washington. A rancher, he’s known for carrying the severed heads of cougars to public meetings. He has said cougars are hurting livestock and ranchers need more liberal hunting laws. Cougars and wolves are the only two animals in North America that self-limit their populations, said Beausoleil. They are territorial and will kill each other to defend their territory. That means that some young cougars, not finding a territory of their own, will die of starvation. For this state, the optimal population is 2,100 cougars, he said, and that means 250 cougars a year can be hunted to keep that population at that number. The state has 50 designated zones for cougar hunts. Killing more cougars than the 250 might not change the overall population numbers, he said. It might just mean it’ll give young cougars a chance to find a place. The Mountain Lion Foundation, headquartered in Sacramento, says that mountain lions are in peril and need to be saved. She also reiterated that this was just the second fatal cougar attack in this state in the last 94 years. 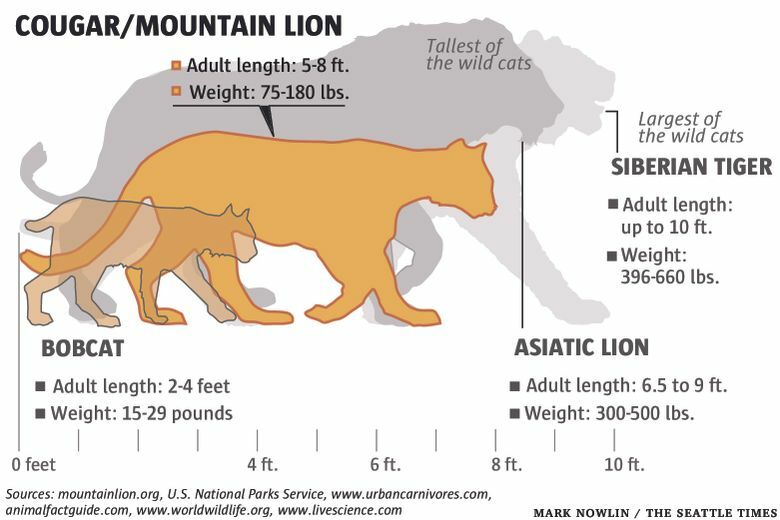 “The risks of encountering a mountain lion are incredibly low, she said.